From the Warp: Why wouldn't you use a carrying case? Why wouldn't you use a carrying case? In all my travels, I've never understood why someone would spend countless hours painting and converting their models only to throw them haphazardly into a shoebox for transporting to and from the hobby store. And then turn around and complain that the paint is chipping off and that's why they don't look so good anymore. Anymore? What?!? When I finished my second Space Hulk commission last month, the painted models all went into a perfectly made foam tray just for them to go into the original game box to KEEP THEM SAFE. My army sits in a foam tray inside a case so that each guy and vehicle doesn't get damaged. And my stuff isn't painted that great to begin with. Why would you NOT take care of your minis after you invest all that time, effort and money into them? I honestly don't understand. Sure, cases can be expensive, but so are the minis. I figure if I'm going to spend that kind of money on a model, I should take care of it too. If you're going to splurge on custom matching dice, drop a few dollars on basic case so your models last as long as your dice do. I've since written a follow-up post to this one that can be found here. I totally agree with this and I'm actually ones of those persons who throws models into a shoebox. I've had paint come off the thinner paints and it's my own fault at the end of the day. Problem with cases you need some where to store them and they're costly and you need the form. But, as mentioned, models are expensive and you don't want to be repainting them all the time. I make cardboard trays that fit into banker's boxes for my stuff. You can get any size you need if you roll your own, and they are obviously super cheap. Try Battle Foam - I just received my order, and they are outstanding! My Ultramarine's fit perfectly, as do my Blood Angels - definitely worth a look at. 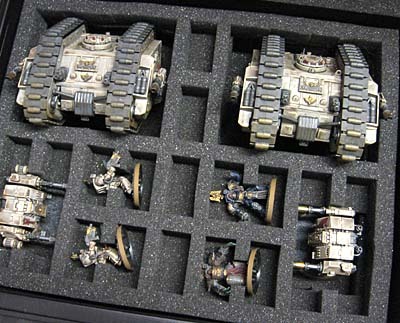 Pricier than GW's cases...but the models are far better protected and actually stay in their slot when you are mobile. I use my one Sabol motor pool bag for my Daemons, Guard, and Marines. Each army has it's own set of foam, so I just grab what I need and put it in the bag. I use pluck foam for my daemons and guard but got the Sabol trays from Battlefoam for my Marines which fit pretty well. Battle Foam is currently suing other manufacturers of custom fitted foam, having business partners claim they find product names confusing to sue over trademark and trying to venue shop the court case to get a favorable result. Basically trying to use the legal system to squash competitors. I can't support them. I go with the Sabol pluck-foam trays for all my models - as soon as they're painted, into a tray they go for storage/transport between games. Of course, that requires a place to store the stacks of trays, but luckily I have plenty of room. The foam trays are also excellent for mailing when I inevitably sell the models, I wrap tissue around the figs to make them snug in the trays, then wrap the tray in egg-shell foam and box them up - the models get to their destinations pristine and unbroken, every time. 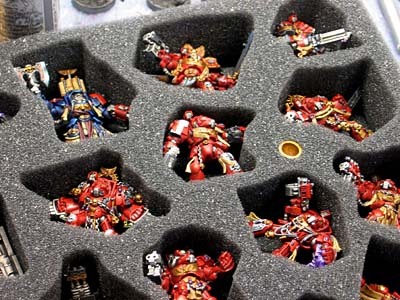 The thought of just tossing my models in a shoebox between games literally makes me cringe! I'm a battlefoam guy as well. Not a fan of their current legal situation, but I love their product regardless. Great customer service too. If they muck up your order, they're generally pretty quick to fix it. It would be nice if you write a follow-up to this blog entry with a review of available troop carrier choices and the product's relative cost. I have yet to purchase a troop carrier and would find the information very helpful! When you order the Sabol foam trays from http://www.thewarstore.com they are remarkably inexpensive at $7.50 a tray. I find this to be a much, much, more affordable option than the battlefoam system. I've been using the Sabol trays for 3 years now and my minis all seem to still have their paint which is very nice, and also the point of having them. A tip for those buying for the first time: Make your cut outs as uniform as possible. Kroot are one of the best examples of a unit that can easily have several shapes cut out for each individual model. However, cutting out a slightly larger pattern can accommodate 90% of my kroot models works much better because it much easier to put them away. I just buy cheap tool boxes and sheets of foam and cut it to fit as desired - voila! A 60-figure box for under £5! Wow, thanks for the comments guys. I didn't think I'd get this kind of response. I'll go through what I have here and put together another post as a follow-up to this one that highlights some of the brands and styles of cases/foam out there. If you've got one you use, drop me a link to it so I can add to the post! Figures in Comfort (http://www.figuresincomfort.net/catalogue/index.php) are a good UK supplier, they're not as fancy as the battle foam cases and trays and they don't do a custom cut service but this is reflected in the price and they do a seriously wide range of trays with a selection of pick and pluck ones so you can tailor those ones to your specific needs. They can also do the cases in a fairly wide range of colours. I have 3 of their cases (a Midi, Super and Legion) and am very, very happy with them - the company changed hands last year but if anything the new owners are even more helpful and accomadating than the previous owner (which is a pretty tall order in itself). For my more heavily used models I gloss cote, then matte cote for a very durable finish. I used to line all my trays with 1/8" foam, but that was *very* tedious and laborious and I lost a percentage of storage capacity. In the end this system has surpassed all other options (IMO) -- cost, storage foot print, flexibility, visibility, durability. I'm Sabol all the way as well. I plan to have a Motor Pool transport for each army some day, and enough foam trays for each model. I've got an IKEA display case where most of my minis live, but if they need transport I bought a huge battle foam "case" (more like back pack). I hadn't heard of their legal woes and it just saddens me. I will spare you my rant here! Everyone who rolls their own transport solutions: Make a tutorial on how you made it. Show the rest of us. That is, in my interpretation the spirit of blogs around here. Sharing is the way to go! The thing is, I've hardly any space in my tiny cottage, and almost all of my models are (a) varnished and (b) plastic, so they generally go into 'pluck' foam compartments in squads of ten. Of course, I don't paint to a high quality, but I've found that in two years of (albeit infrequent) use I've suffered only one breakage, which was so minor as to be negligable. Not for everyone, I know, but when you've around 300 plastic infantry*, it works a treat, and a damned site cheaper at only £12 per case. * I started on this when I had a huge infantry-only 'Light Infantry' army under the old IG Codex. These days, it's fewer men and a few more tanks. I know that if you want a cheep alternative you can use foam egg cartons and carry them in a milk crate. This is something that a friend of mine did with his ork army for the longest time. A crap ton of egg cartons! Strangely, just posted a short review of the Feldherr Mini case last night. I use the shoebox method, with models nestled into layers of fabric. I used to use tissues but kept having to pluck bits of fluff off my models. Still had some broken though. The main reason I use shoe and tackle boxes over proper cases is because I play DE. Raiders do not fit in anything. Come to think of it wyches and warriors like being a pain in the neck too. But raiders are the true headaches. Well, I certainly understand that you would want to protect your pieces, foam (custom or not) and a locking hard case can be expensive or time consuming. I've reinforced a sturdy shoe box with extra cardboard and some balsa wood and layered fabric and cotton balls between pieces. It's worked so far, and it's cool to make something yourself like that.